It is an epic that is known to capture every emotion that a person will ever feel. It was dictated by the great Sage Vyasa and penned by the elephant headed god. It is not something one reads at home because it creates discord in the household. I am talking about the Mahabharata – in which the instructions on how to live a righteous life and attain salvation was given by the blue skinned god Krishna – who is considered an avatar. 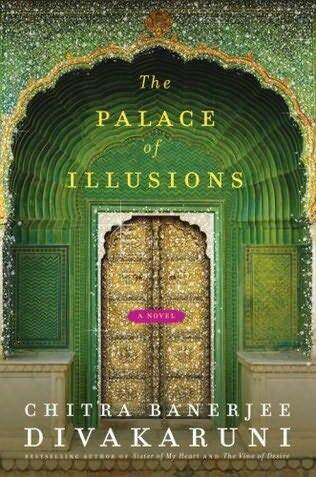 Now think of looking at this entire epic from a woman’s point of view and you will be reading Palace of Illusions by Chitra Banerjee Divakaruni. Some would think it is chick lit – I guess it is a question of perspective. Once I started reading, I needed to find out what happened next. What held me was the aura that was created by the heroine Draupadi -daughter of Drupad or Panchali – one with 5 husbands or Krishnaa – the dark one like the god himself – same person but called by different names by different people based on the events that shaped her life. Much of what happened to her determined the fate of the war – but all is fair and love and war. Most children of Indian origin grow up listening to the stories that make up the Mahabharata. The stories were all there, what was interesting was being privy to the thoughts and emotions that Paanchali went through as the story unfolds. Even though it is only a story – at some point it was hard to figure out which was part of the epic and where did the author’s story come in. Every character was brought to life, every action was justified and it gave new meaning to why they did what they did. The author did a great job so much so that I could feel the pang of loneliness as the Princess that was considered cold, the tug of war for control between the daughter in law and mother in law, the unjustness in having to deal with 5 husbands when it was not what she wanted, the humiliation of being dragged by the hair in open court, the pride that would not allow her to beg the enemy of stopping what they started- she was born out of the sacrificial fire into a realm of vengeance and that was the primary emotion that ruled her life. Categorized under: Being Indian, Books.